State-name shield courtesy Lou Corsaro. 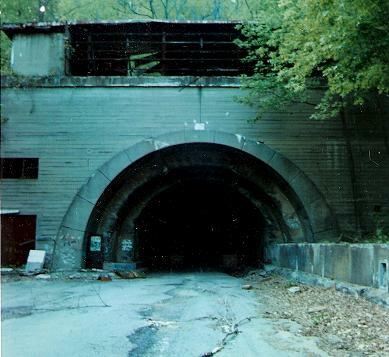 The eastern end of the Laurel Hill Tunnel in 1997, courtesy Scott Sullivan. The "LAUREL HILL" above the entrance has fallen off. 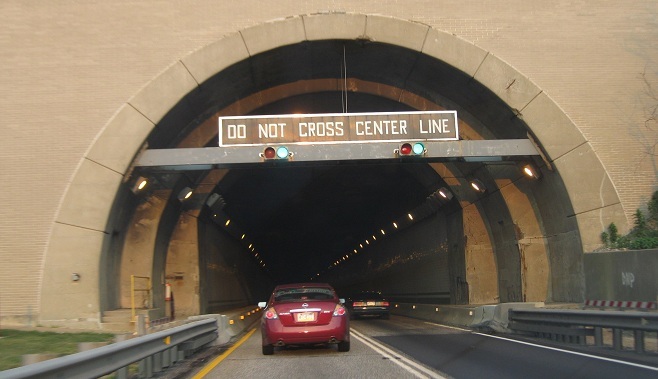 This tunnel was bypassed along with the two on the abandoned Turnpike east of Breezewood (see link at bottom), but is not accessible to the public. Thanks to Doug Kerr for capturing these at the PA Turnpike museum. These were once speed warning signs on the original section of the Turnpike (all of which is now I-76), heading into either a tunnel or a tollbooth. One of many tunnels on the Turnpike. All are four lanes now, though the Turnpike was built with nothing but 2-lane tunnels. 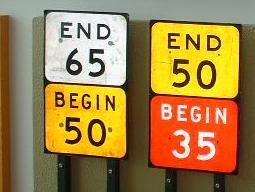 A few EB tunnels, courtesy Lou Corsaro. The middle one is the direction of the Tuscarora I didn't already show you. 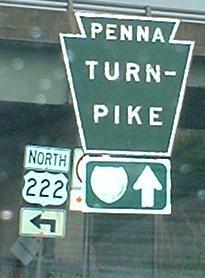 I-283 SB, using a sort of outlined shield that's reminiscent of the days when these signs were button copy. Newer shields are black on white. 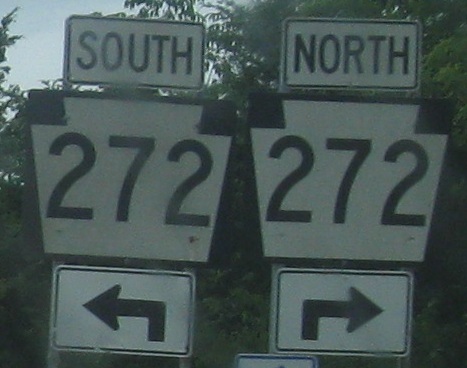 Keeping left keeps you on I-283 to the end, but taking the exit puts you on PA 283 - the two are signed as a continuous route, though. Courtesy Michael Summa (but a modern  photo, for a change). Hey, when you're actually making money (toll agencies do, DOT's don't), you can afford to commission a huge highway sign that doesn't do anything for traffic. The building is just off I-283. There are a bunch of super-sized PATP trailblazers at Turnpike entrances from connecting roads. This is the second or third one you would see if entering from PA 272 or US 222 SB (NB would miss this one), and one of the only button-copy ones left. In the other direction, the end of the connecting road at the US 222 interchange. I-76 EB exiting the Turnpike, courtesy Scott Colbert. 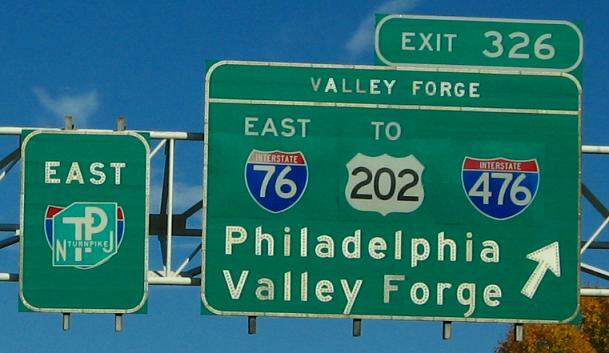 Clearly the sign was extensively patched - all three shields on the right sign are new, and underneath them was at least an old I-76 shield. Chris Commans explains that since the sign predates the completion of the Blue Route (I-476 south of the Turnpike), underneath was originally just EAST I-76 TO US 202. Also, the sign on the left should have been patched better. 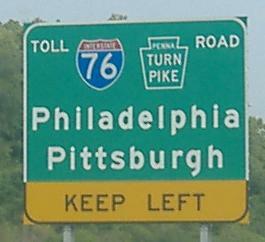 What was the PTC thinking - were they looking for a PA Turnpike shield? Did they forget that I-276 goes another thirty miles before meeting the NJ Turnpike, and that the NJ Turnpike is strictly a north-south road? Something went very, very wrong.